Recorded on authentic equipment, using period instruments and effects, this album distils every single drop of 1960's musical psychedelia into a perfect 6 track mini-album. Xtc pay tribute to their boyhood heroes by becoming the group they dreamed of being when they were schoolboys. Not one duff moment. eingespielt. Muss man haben !!! If, like me, you have a soft spot for the bonehead grandeur of bands like the Strawberry Alarm Clock, Iron Butterfly and the Electric Prunes, then you're ripe for 25 O'Clock. 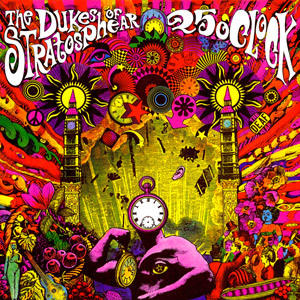 Encased in the most psychedelic sleeve since Cream's Disraeli Gears O'Clock is an affectionate six-tune send-up of the music, magic and madness of the flower-powered '60s, as conceived and executed by Britain's cheeky XTC (aka The Dukes). On one level, the Dukes seem part of a neopsychedelic revival, right up there with Stephen Sprouse mini-skirts, Keith Haring graphics and the acid-rock flavoring of bands as varied as the Furs, the Bunnymen, U ("I started a landslide in my ego")2 and Prince. Still none of these elements are part of a bonafide scene as they may have been 15 or 20 years ago. As a result 25 O'Clock doesn't have the potency, both as parody and as an engaging chunk of vinyl in its own right, that it could have had had it been issued, say, in 1970. Still, it is wonderful, chockful of phase-shifted vocals, tinkly harpsichords, modal guitar figures, eerie mellotron washes, acid-inspired tape effects and deliriously nonsensical lyrics rife with words like "vibrations," "flow" and "rainbow." My fave rave is Your Gold Dress, a five-minute blend of In-a-Gadda-da-Vida, Downtown and Summer Wind (not to mention The Who and the Moodys) that has to be heard to be believed. Obviously.